1 Insert the Mac OS X Install DVD into the optical disc drive of the other computer. 2 If the other computer is a Mac, open /Applications/Utilities/Remote Install Mac OS X. application.) 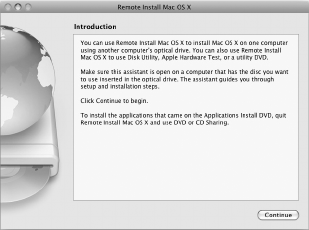 On Windows, choose “Remote Install Mac OS X” from the Install Assistant. 3 Read the introduction and click Continue. 4 Select the installation disc you want to use, and click Continue. the other computer is on an Ethernet network. Click Continue. 7 Choose a startup disk. 8 Click Continue in Remote Install Mac OS X.